Notes: I just loved the picture of this in the pattern booklet, and there are lots of cute ones on Ravelry. I do like the design, but I'm not sure that the shape of it really fits me the way that I'd like it to. It is a smidge too big in the shoulder area and it is more flared than I like. But that's okay--I think this one will still see some wear. If you plan to make this, be sure to look for the errata because there are a lot of corrections. I stayed pretty true to the pattern, except that I changed the placement of the yoke decreases so that they'd line up better. I also moved the buttonhole over a little bit: k2, k2tog, yo, k1. 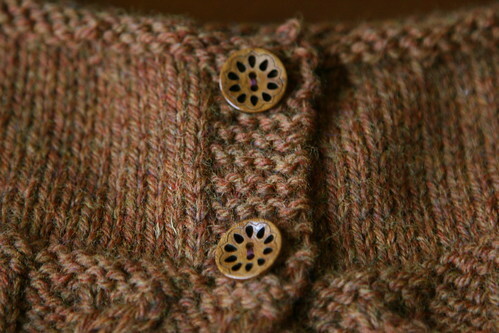 The buttonhole won't be symmetric within the garter ridge panel, but once you put a button in, it'll look centered.